To make your own perfect penguin, you are going to need an empty toilet roll. If you don’t have one right now, maybe wait a few days and keeping checking around the around. One will appear sooner or later! You could also find an empty kitchen roll and just cut it in two. 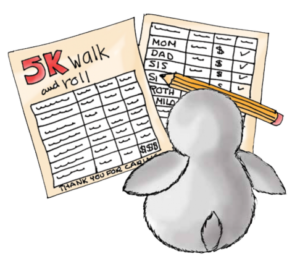 The more toilet rolls you collect, the more penguins you can make. You’re also going to need some black and white paint, a few google eyes, and black and orange paper. 1. Lie your toilet roll flat and draw two straight lines upwards from one edge. Draw a curved line to connect the two straight lines. 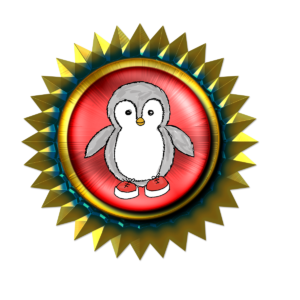 This is the outline of the penguin’s white tummy fur. 2. For the feet, use a pencil to copy our design (above) on to some orange paper. Then cut them out using scissors. 3. For the beak, draw and cut out a kite shape from the orange paper. 4. Fold over the shorter half of the kite to make the top part of the beak. 5. Cut a pair of penguin flippers out of the black paper. The look a bit like long leaves. 6. Paint the toilet roll body of the penguin, keeping within the lines you drew earlier. Do the black paint first so that you don’t accidentally get any in the white tummy area. 7. Use some glue to stick on the googly eyes and orange beak. For the beak, only put glue on the larger bottom half of the kite shape, so that the top half still folds over. 8. Use the glue again to stick on the flippers and feet. Attach the flippers to the back of the toilet roll so that they point outwards. For the feet, fold over the back of the paper and stick this to the inside of the toilet roll. It’s a lot easier than trying to stick the paper to the thin toilet roll rim! Click photo to purchase. Inclusive playground story is included. Play and laughter is a vital part of childhood. 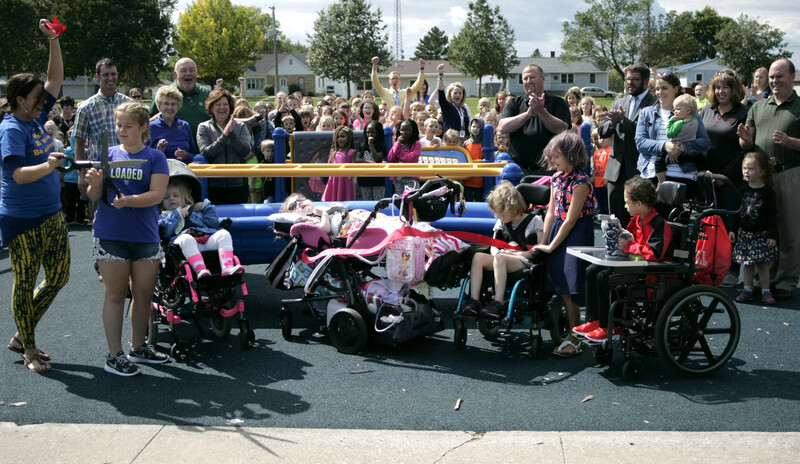 An all inclusive playgroud has become realy because of the Lancaster Community fundraisers and through grants. “It was between the Friends of Winskill Elementary, the Community Fund and basically our kids. Our kids are the ones that sell the pizzas,” Sperle said. “Our kids really had a huge part and they are the ones that raise the money for the 5K. It really was a combination effort of our kids and the Lancaster Community Fund. It was awesome. 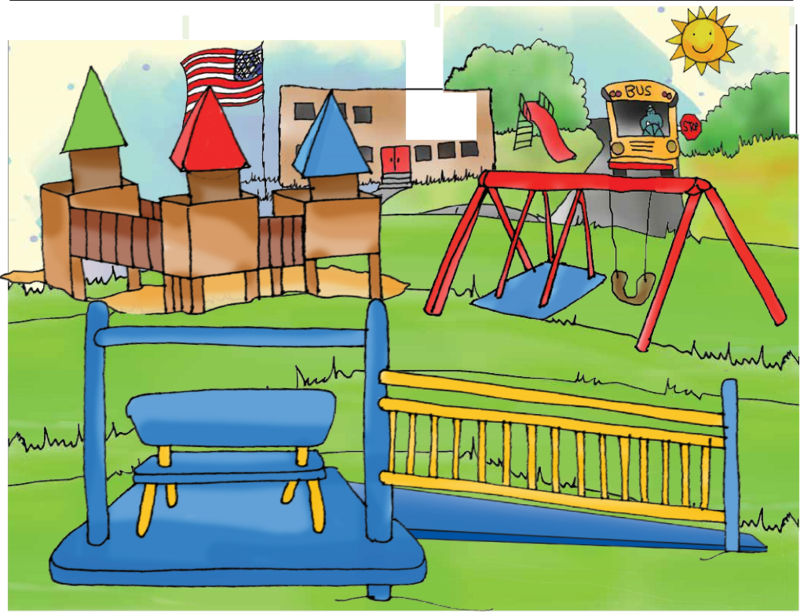 Learn about playground equipment for different ages and stages so ALL CHILDREN can play with friends. Thanks Landscape Structure – Inclusive Playgrounds – we love you! FREE KNOW ME CARDS – these are great! 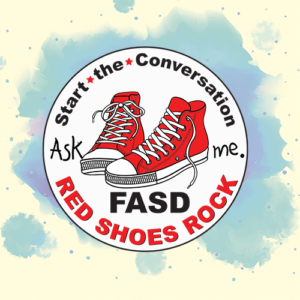 FASD is REAL. And so am I. And so is Furry The Penguin. Mac is off and running, or should we include, teetering, tottering, wobbling and rolling, with Furry. Last year, Mac and Red Shoes Rock, reached over 1/2 million people through Facebook, Twitter, InstaGram, Tumbler and Snap Chat. We reached 63 counties in 45 language – MAC WANTS TO REACH THE WHOLE WORLD. 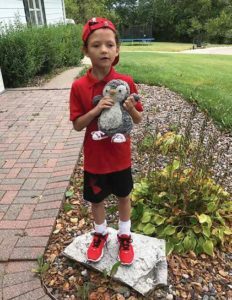 His big buddy, RJ Formanek started the movement of Red Shoes Rock in 2013 and we are forever grateful. This is a world-wide effort. Hello, my name is Mac and I am now eight years old. 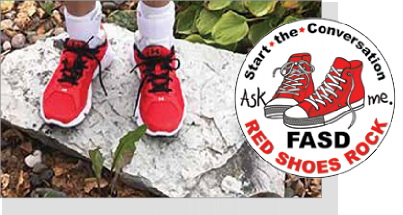 For the past five years, I have been putting on my RED SHOES and running to build awareness for Fetal Alcohol Spectrum Disorders (FASD). Some people still do not believe FASD it is real. I promise you it is REALY REAL! And I am sure if you take time to get to know me you will learn A LOT about FASD and how it changes a person’s life. FASD is more prevalent that autism. Thankfully, we are no longer hidden or hopeless. Furry and I are going to make sure of that. I also live with autism and some other challenges (over 100 of them, just to let you know). I am still Mac. And normal to me is JUST LIKE I AM! Check out my friends here. You will meet adults, children and their families. Kind comments are appreciated. In Kindergarten, we worked on Manners! Meet 90 Real People with Real Lives living with the challenges of Fetal Alcohol Spectrum Disorders. 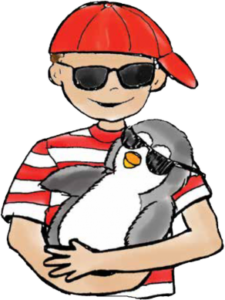 Now you can your own Furry, penguin gear and his little friends that join us on our International Red Shoes Rock campaign. 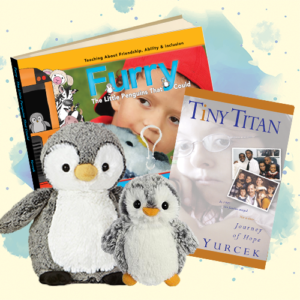 And ta’da’ this could be day we OPEN OUR STORE to share our new book Furry: The Little Penguins That Could. We had planned on opening on July 15, but as would be expected Squirrel and Monkey came in and messed everything up. So we are busy cleaning up their mess. 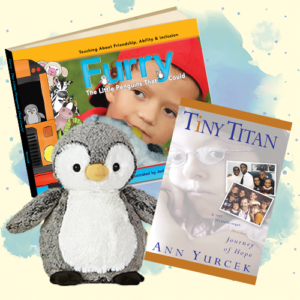 Full curriculum coming in September 2018. Meanwhile you can enjoy our “FREE” CAN DO FUN PAGES.